As a construction worker, Scottsbluff resident Dean Cress is used to demanding jobs, but nothing prepared him for the events of November 29, 2011. Dean and his co-workers at GEM Construction were doing demolition work at the former Scotts Bluff County Jail building in Gering when Dean got caught between a forklift and a wall. Momentum propelled the forklift up his leg, crushing his hip and fracturing his leg in nine places. Emergency personnel responded within minutes but it took a half hour to extract him from beneath the forklift while he lapsed in and out of consciousness. Dean was immediately transported via medical helicopter to Medical Center of the Rockies in Loveland, Colo., where he endured four surgeries, including the amputation of his entire right leg. “I remember the first 15 minutes of the helicopter ride, and that’s it until I woke up the week of Christmas,” says Dean. Two weeks later, Dean was moved to Regional West’s Acute Rehabilitation unit, where he spent one and a half months recovering and learning how to adapt to the amputation. After several months in a wheelchair, he graduated to crutches. He now has a prosthesis. 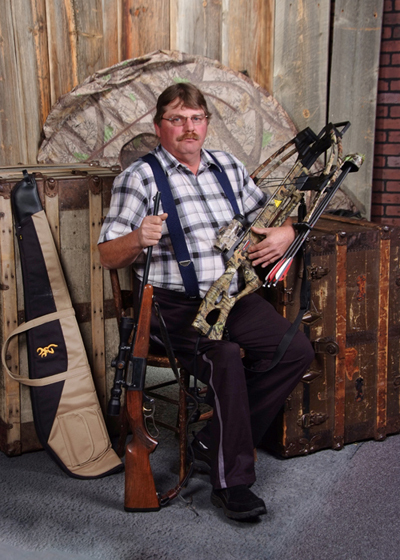 Dean gave up stock car racing for safety reasons, but with his new prosthesis he remains an avid hunter.